Irvine, Calif. (March 12, 2018) ­— The Democratic Party of Orange County (DPOC), the governing body of the Democratic Party in the nation’s sixth-largest county, approved a resolution last week urging the county’s 34 cities to approve more housing developments and reduce land use regulations that restrict home construction. The resolution notes rising housing costs are largely a result of restrictive zoning that limits the supply of housing, and increasing the supply can reduce the cost of housing across Orange County. The resolution calls on leaders with land-use authority to approve homes located near public transportation and in walkable communities with an emphasis on more affordable multi-family housing. It also asks lawmakers to increase affordable housing subsidies and reduce regulatory barriers to housing construction. 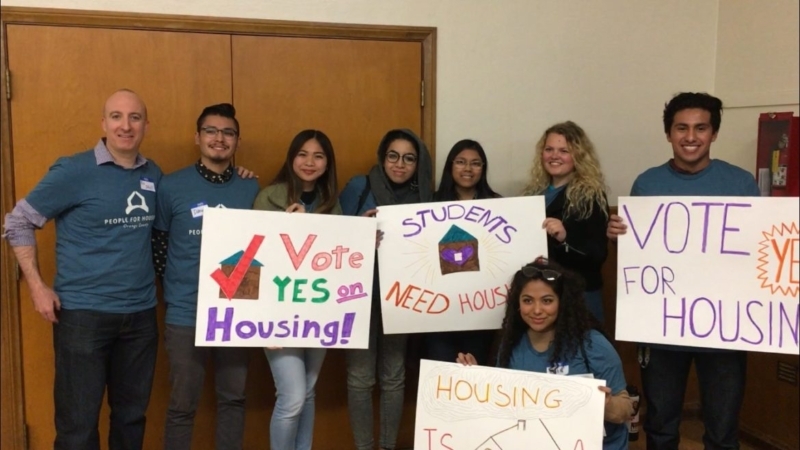 Responding to several cities that have attempted to restrict home building at the ballot box, the resolution opposes “zoning and planning through ballot-box initiatives and referenda” that restrict funding or approval of affordable housing. The resolution was approved on February 26, 2018 by the Central Committee of the Democratic Party of Orange County, which includes local Democrats elected by voters in each Assembly District, as well as partisan-level Democratic elected officials and nominees. The resolution was co-authored by Kenneth Stahl, coordinator of the Irvine chapter of People for Housing – Orange County and Director of the Environmental, Land Use and Real Estate Law program at Chapman University Fowler School of Law, and Cassius Rutherford, an undergraduate student at UC Irvine and Director of the Associated Students UC Irvine Housing Security Commission. Orange County’s housing costs are among the highest in the country, and have contributed to an increase in homelessness, a rapidly aging population, a decline in economic productivity, and long commutes for many Orange County workers.